If your Mitsubishi needs an auto body repair, you shouldn't trust your vehicle to just any collision shop in Ontario. Your Mitsubishi transports you and your loved ones through life's daily trips and unexpected adventures, and you need to be able to depend on it. It's not overly cautious to choose an auto body shop like you would your family doctor or dentist. (Simply because the insurance company says to go to one doctor doesn't mean you won't find the practitioner best for you. The same goes for auto body repair.) In the long run, this careful approach will save you not only money, but also time and aggravation. The caliber of our staff and facility is a direct reflection of our commitment to you and your car. 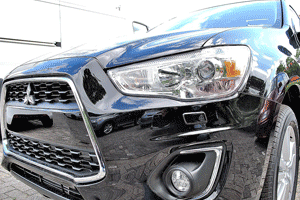 We understand and appreciate that you depend on your Mitsubishi, so we work very hard to make the task of collision repair easy and convenient for you. You want your Mitsubishi out of the shop and back on the road-and so do we!-in its best possible condition. For Mitsubishi Auto Body Repair in Ontario, We've Got You Covered! Enjoy the peace of mind that comes from knowing you've taken your Mitsubishi to an auto body shop that has a proven track record of working on vehicles just like yours. Visit our shop located in Ontario, contact us online, or give us a call to schedule an appointment for your Mitsubishi.